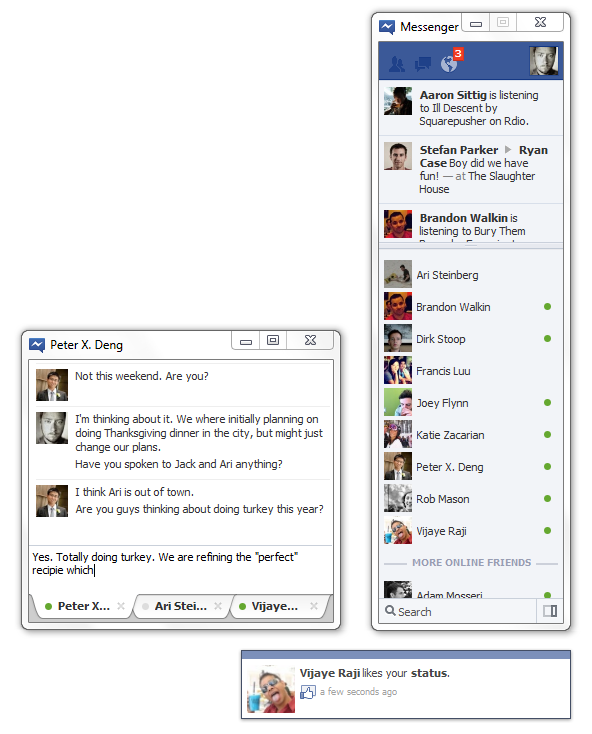 Facebook has launched a standalone Windows 7 application that lets you chat with Facebook contacts. While there are many third party Windows applications like Windows Messenger that lets you chat with Facebook contacts, the official application has Facebook specific features – live Facebook ticker, preview of messages, notifications and friend request. The application shows Ticker on top of the window and displays friends (online and offline) on the next half. The chat features of the application are very similar to the popular chat applications. Multiple chat windows can be arranged as a tabs in a single window. The notifications are well integrated with Windows OS and you they look similar to Outlook’s new email alerts. You can also dock the application to the sidebar of Windows and when docked the chat application is visible even if you open any other applications. Overall the application looks very simple, clean and performs best of what it is supposed to do. Chatting with your Facebook friends and being on top of Facebook alerts was never this easy.